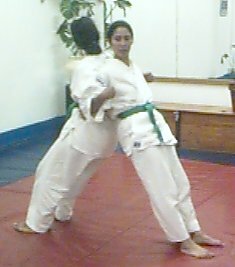 Karate is not body-building; there is little to be gained by developing a lot of bulging muscles. All you need is enough power to slow up your opponent, while you yourself move smoothly and flexibly. When using barbells, dumbbells (in the lack of either, use rocks) or the like, start with lighter, naturally manageable weights and work up from there.